The Buchi Kilo Suite (ATEX Rated 65 L vessel) pilot scale glass reactor suite has a 65 L capacity, capable of operating under various modes including reaction, distillation, crystallisation and extraction. Located in a zoned, mechanically vented area the system can be operated safely using solvents with an autoignition temperature of below 200 °C (T3). The 65 L jacketed vessel has a temperature range of -30 °C to 200°C controlled by a heater chiller unit. A variety of process data from the Buchi suite is automatically collected via the control systems, monitoring a variety of temperatures from various PT 100 probes (oil inlet/outlet, process temp, condenser inlet/outlet temperature, vapour temperature). Azeotropic distillation can be accomplished separating both phases using the reflux divider. 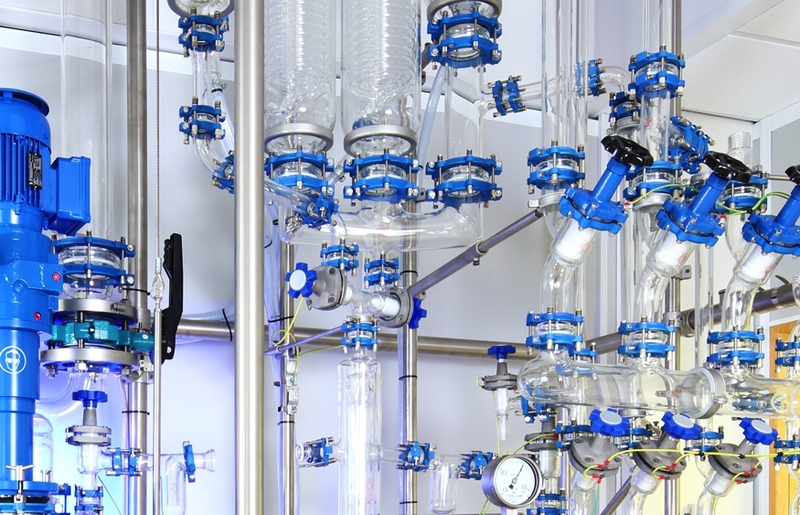 Distillation either through the packed column or vapour duct allows the separation of complex mixtures of compounds or bulk solvent removal that can easily mimicked on a larger scale. Low-temperature crystallisation can be accomplished with the control from the heater chiller unit and can be operated at -30 °C. If you would like to learn more about our glass reactor suite, please speak to Darren.